You’ve spent weeks … or was it months … getting to the point where you’ve managed to arrange a face-to-face meeting with a prospective client … and the meeting went well! Here’s what you did and what you didn’t do in that meeting that made it so good. You didn’t do the old dog and pony show where you mostly talked about how wonderful you and your firm are. And that’s really easy to do, because you’re proud of the work you do for people and you want to tell people what you can do for them. But that’s not really what they’re interested in. At least not in the beginning. It’s not what’s going to motivate them to say yes to working with you. In fact, it’s a critical mistake, because you’d be putting the cart before the horse. Do they have to see you and your firm as competent and trustworthy … with a good reputation? Sure, but you know that’s not enough. It’s just a necessary element … a potential deal breaker if they don’t like what they see, but not a deal maker. You knew that what they were really interested in is their issues, their problems and how you might be able to help them deal with them. So you asked great questions that showed you’d done your homework. You gave the client plenty of opportunity to share what’s going on with them and you really listened. That’s what’s missing in so many of these interactions. Genuine, focused listening. When they know you’re listening … you “get it” … and you care, they want to know how you can be of assistance. But here’s the thing. As well as the meeting went, the client wasn’t ready to commit to doing business together right then and there. Nothing unusual about that. But you did the right thing … the smart thing … and scheduled a next step. In this case, it was scheduling a follow-up meeting in a couple of months. Never let a prospective client leave a call or a meeting with you without recommending a next step and scheduling it if they’re open to it. Okay, so you’ve done everything right so far. So, what’s next? Do you just wait for the next meeting date? No, but you don’t want be annoying or appear pushy either, so here’s a simple bit of advice. Send them an email that recaps the high points of the discussion and provides any follow-up information on the subjects discussed that would be pertinent. The latter shows you’re already on the case, even if the relationship hasn’t been formalized yet. 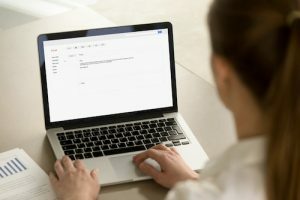 You want to write the email in such a way that the recipient will respond, which keeps the interaction alive and the relationship moving forward, as opposed to languishing in silence. It was great meeting with you today and learning more about your company, especially your challenges and goals for the year. We’ve worked with several businesses that have faced similar issues, so we understand what’s at stake. In fact, I wrote a memo for a past client that specifically addresses (specify the challenge/problem) and I wanted to share it with you. I hope you find it helpful. In addition, I’ve written a recap of our meeting and offered some additional thoughts and possible next steps. Let me know if I missed anything or if you have any questions. Please let me know what works for you and your team. Finally, you mentioned that you presented at a conference recently on [topic]. Would you be willing to share your slides/handouts? I’d like to share them with my team. That’s how you do it. It’s simple … and effective.